Upcycled T-shirt fabric flower tutorial puts those project scraps to work. A lot of our t-shirt transformation projects require an unceremonious hacking off of the sleeves. That leaves a lot of unclaimed sleeves laying around ​and adds up to a good deal of scrap fabric. 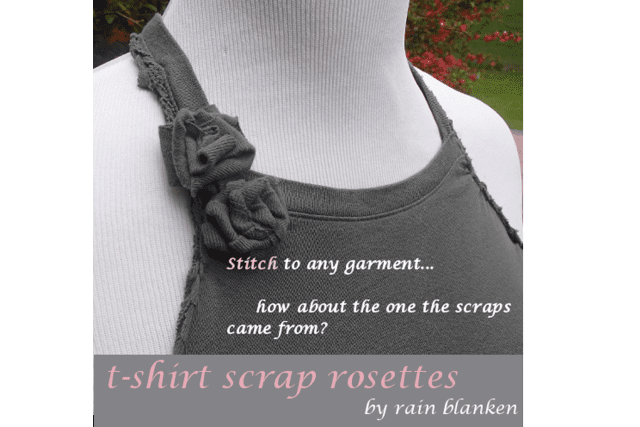 What we love about these scraps is that they can be turned right back into embellishments for the shirt they came from. Trim off the hem of the sleeve. Cut a strip about 1 1/2" wide. This will make a rosette that has 3/4" layers. This is a rather small sleeve from a fitted woman's t-shirt, so to get rosettes this size, you'll want to trim your strip to 6" long. If you want a bigger rose, cut a wider, longer strip. Experiment with different lengths to get various sizes. There will probably be leftover stitching from the edges of the sleeve. Trim these off to make nice, straight edges on your strip. You can get more than one strip out of a sleeve, but they will be varying sizes. Use this to your advantage in your designs, or save them for headbands and wristlets. Fold your fabric strip in half lengthwise. This will give the rosette plush and flat dimensions. Twist the end of the folded strip, then crush it flat. The goal here is to create the center of the bud. If it doesn't look perfect, no worries. We will be able to arrange and stitch it down later. Fold the fabric strip under the bud at a 90-degree angle. Turn the bud counter-clockwise and fold the strip under again. Keep turning the bud and folding under the fabric until you've formed the body of the rosette. If things aren't looking right, just give it another try. Be sure that your folds are making nice, sharp corners. Try turning the rosette just a bit between each fold, or turn it a lot to make just a few large petals. It's all about getting the look you want, so don't be afraid to mess around with it for a while. Using a matching thread, start your needle from the back of the rosette to come up through the middle. Use small stitches to hide them as you pin down the middle of the bud. N0w is the time to rearrange the middle of the rose to your liking. Coming through from the back of the rose again, stitch near the center of your petals to help secure each layer of the rose. One stitch in each petal should keep it all in place. Just be sure to work between the layers, hiding your stitches under the petals above. Finish your rosettes by tying off the thread, then working the tail of the thread into the back of the flower before clipping it. Now you can stitch your rosettes onto any project. We chose to put mine right back on the shirt we harvested the sleeve material from, our braided trident racerback transformation.